(4) The dimensions emin and m for use in 6.2.4 should be determined from Figure 6.8. (5) The effective lengths of an equivalent T-stub flange Cefr should be determined in accordance with 6.2.4.2 using the values for each bolt-row given in Table 6.5. The value of a for use in Table 6.5 should be obtained from Figure 6.11. (6) The stiffeners should meet the requirements specified in 6.2.6.1.
a should be obtained from Figure 6.11. - each group of bolt-rows required to resist tension. (2) The groups of bolt-rows either side of any stiffener connected to the end-plate should be treated as separate equivalent T-stubs. In extended end-plates, the bolt-row in the extended part should also be treated as a separate equivalent T-stub, see Figure 6.10. 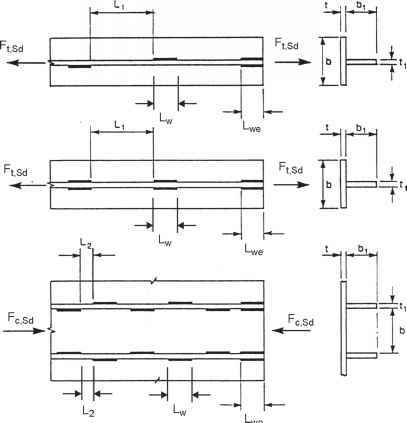 The design resistance and failure mode should be determined separately for each equivalent T-stub. (3) The dimension emin required for use in 6.2.4 should be obtained from Figure 6.8 for that part of the end-plate located between the beam flanges. 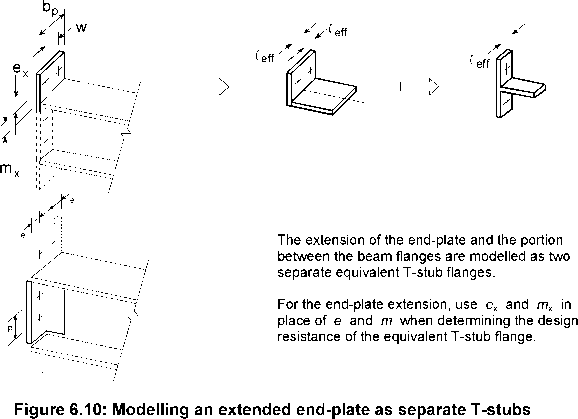 For the end-plate extension emin should be taken as equal to ex , see Figure 6.10. (4) The effective length of an equivalent T-stub flange £eff should be determined in accordance with 6.2.4.2 using the values for each bolt-row given in Table 6.6. (5) The values of m and mx for use in Table 6.6 should be obtained from Figure 6.10.